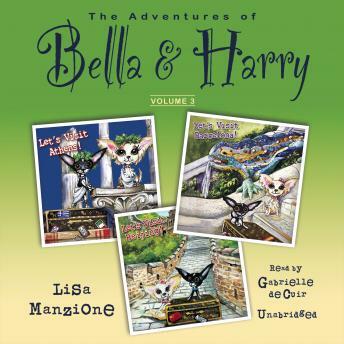 The Adventures of Bella & Harry, Vol. 3: Let's Visit Athens!, Let's Visit Barcelona!, and Let's Visit Beijing! Then join Bella and Harry as they travel to Barcelona with their family and spend time at Las Ramblas, La Sagrada Familia, Park Guell, and other magnificent places. Local cuisine (such as tapas) and some basic Spanish phrases are also introduced. Lastly, join Bella and Harry as they travel to Beijing with their family and visit the Forbidden City, explore the Temple of Heaven, walk along the Great Wall of China, and do other fun things. Take a side trip to Xian and see the Terracotta Warriors. Go to Chengdu and learn about pandas. Local cuisine and some basic local phrases are also introduced to young listeners. Adventures of Bella & Harry, Vol. 3: Let's Visit Athens!, Let's Visit Barcelona!, and Let's Visit Beijing!